Dublin: The cost of Ireland’s austerity program on the poor and disadvantaged was made clear to me Tuesday as I made my way to the Irish parliamentary building for a meeting. I was overtaken by a crowd of about 500 parents and children, most with special needs, on their way to protest outside the Dail. The cutbacks in services mandated by Brussels and the IMF has deeply affected those most in need. Amid all the talk of green shoots of recovery in Ireland and discussion about debt repayment schedules the little people are feeling the pinch most acutely. In the case of the protesting parents it was the withdrawal of Special Needs Assistants, or SNA’s to look after their kids in schools. Thus, autistic children, Down Syndrome children, and others with serious developmental problems are no longer offered the wide array of SNA’s that was there previously. It is part of the savage cutbacks mandated by the European Union to bring Ireland’s budgets in line. Education has been among the hardest hot areas with daily headlines about a looming shortage of teachers and cut back curriculums. The protestors were blaming the arrogant bankers and the government and it was hard not to be affected as smother after mother took the microphone and talked about the deep anguish the loss of the SNA teacher had made in their lives. This is where the rubber meets the road in the Irish recession, where all the high-level talks about debt restructuring and funding finally trickles down and hurts the most needy. ‘Tip’ O’Neill the famous Speaker of the House once said the test of a country was how it handled its youngest, neediest and oldest. 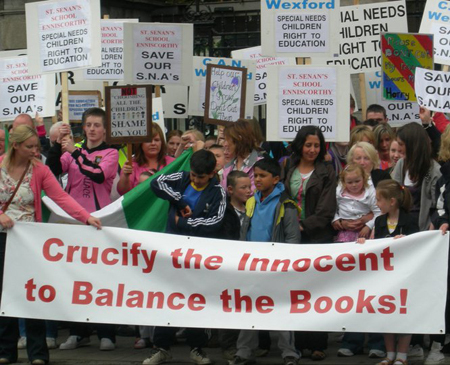 By any standards Ireland has begun to fail that test like never before in modern times. You won’t see that featuring among the high levels discussion in Europe this weekend, but the reality is that when elephants fight it is the grass that gets trampled.